Once again, Swift steps up big for her fans. Taylor Swift's under-the-radar generosity strikes again. The singer donated $15,500 to the GoFundMe page set up by a young fan whose mom has been in a coma for three years. Earlier this month, the fan, Sadie, tweeted out the link to her GoFundMe page and wrote to her fellow Swifties, "Hey guys. I’m really nervous to post this. Please help if you can and pray for my family. I’m sorry I never said anything sooner and that I’m suddenly asking for help. I love you guys so much." The tweet contained the text of a lengthy letter in which Sadie explained that her mom has been in a coma because of an ulcer that bled and cut off oxygen to her brain. While she's made some progress, she is still considered to be comatose until she's able to communicate, Sadie said. "I'm happy to provide for my family but I am 19 and everything is really hard right now," she added. "I feel like I've reached my breaking point...please help if you can." The "most-liked" donation is Taylor's, and it reads, "Love, Taylor, Meredith and Olivia Swift." That's actually what it says on Sadie's Twitter page profile, so Taylor obviously did her research. A source told ABC News that Swift did in fact make the donation. 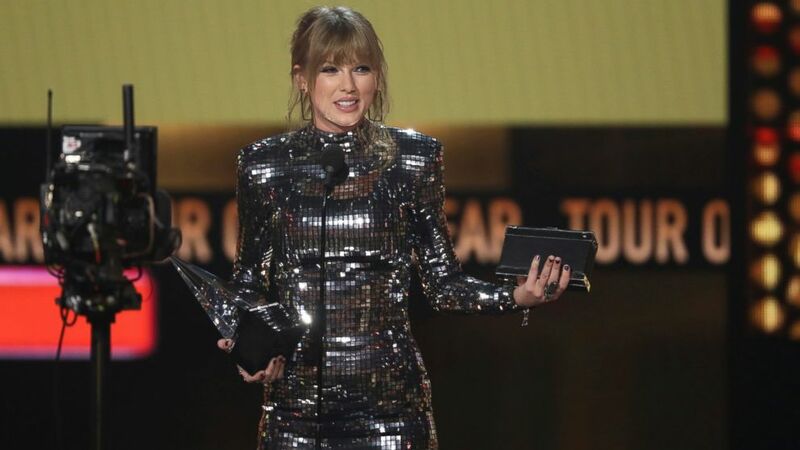 (AP) Taylor Swift accepts the award for tour of the year at the American Music Awards on Tuesday, Oct. 9, 2018, at the Microsoft Theater in Los Angeles. "You guys this is amazing," Sadie tweeted. "I love Taylor so much." Thanks to Taylor, the GoFundMe site has now raised more than $25,800 of its $40,000 goal.